Cityhall:Girls With Guitars Take Over! Title: Girls With Guitars Take Over! A deluxe vinyl-only collection of guitar-toting all-girl bands, drop-dead female frat rock and axe-centric she-pop. Pressed on 180g mandarin-colored vinyl in heavy-duty sleeve, with a swanky inner bag sporting a fact-filled 3500-word note and many rare photos. 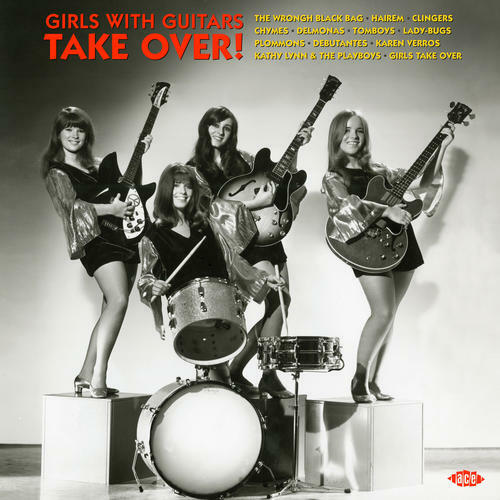 The eye-grabbing front cover features a great shot of Girls Take Over (sisters Cindy, Rinie and Wendy Wilhelmi and their pal Geri Gibson), who open the show with their fabulously raw and pounding version of 'Hi Heel Sneekers', recorded in "some guy's attic" in Milwaukee circa 1969.